Make the blue cheese sauce by adding the following ingredients to a food processor or blender*: blue cheese, heavy cream, sour cream, shallot, lemon zest and lemon juice. Process the ingredients until the mixture is smooth and creamy. Season with salt and pepper to taste. For the garnish mixture, take a small mixing bowl and add the celery, parsley, vinegar and oil to it, tossing to combine. Season with salt and pepper. Add the first 3 ingredients to a mortar bowl or spice grinder, grinding them into a fine powder using either the pestle (if you’re using a mortar) or the grinder. Add the following ingredients into a large mixing bowl: ground chicken, chopped parsley, Parmesan, grated onion, eggs, garlic, extra virgin olive oil and the crushed spices. Use your hands to combine the ingredients just until it’s blended and smooth (they suggest this will take 2 minutes). Cover the bowl and place it in the fridge for 1 hour. Preheat your oven to 400 degrees. Take a jelly-roll pan and line it with aluminum foil, spraying the foil lightly with nonstick cooking spray afterwards. Drop the chicken mixture down by the rounded spoonfuls using a medium-size cookie scoop (about 1 ½-inches) onto the lined pan, keeping the meatballs 1 ½-inches apart. Stick the meatballs in the oven to cook for 10 to 12 minutes or until the meatballs are fully cooked. In a large bowl, toss the meatballs with the hot sauce. Place them on the split buns, topping them with the blue cheese sauce and the garnish. *We decided to just combine the mixture in a bowl instead of making it smooth. We think this was a delicious slider ! For ourselves, we didn’t think the topping tasted bad but it didn’t make the slider taste better, it did add a nice crunch that was missing otherwise. Your taste buds may be different from ours though so it’s worth trying out yourself. 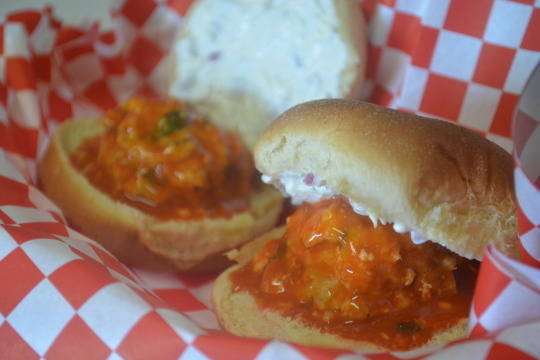 This is another way to use the classic combination of chicken, buffalo sauce and blue cheese. It’s classic for a reason, this was a damn delicious slider that ‘s great to have for a game day snack or anytime really ! These are kind of addictive, so depending on how many people you plan on serving, you may want to double the recipe ! We weren’t paid in any form to promote Frank’s or Southern Living.